I’m back! It’s a Christmas miracle! Slight exaggeration but it was cold during my tour. How did I manage? You’ll have to stay tuned for my full tour post to find out. Right now I want to tell you about the latest book I read, A New York Christmas by Anne Perry. This book tells the tale about a young woman, named Jemima who accompanies her friend Delphinia all the way from London to New York City. The year is 1904, so they obviously needed a boat. Delphinia, who comes from a wealthy family, is naturally, set to marry a very wealthy man. Two wealthy families joining will be a grand affair in New York City. Delphinia’s mother, Maria, left her as a child and Jemima is aware of this but doesn’t know the full story. Some speak very ill of Maria, others more understanding, but most don’t speak of her at all. The groom’s brother suspects that Maria could show up at the wedding and cause a huge scandal. He wants to stop this from happening and enlists Jemima’s help. The ever-caring friend, Jemima gets swept up in the search for Maria. Jemima gets in deep and things go a little cray cray. What did she get herself into? First of all, keep in mind that this book is short, so everything happens very fast. The story and characters seem like they could have been more developed, but you have to take the book for what it is meant to be, which is a light, fun, & easy read. The first turn of events caught me a little off guard, but that made me more invested in the book. If you know me, you know I need a little bit of a love story in my books and thankfully this book delivered on that aspect. If you need a quick, easy, and enjoyable book, then this book is for you! Ya know what else is cool? It’s set during Christmas-time in New York City, so you know what that means…here’s my sneak peek into my not-so-solo-this-time tour in the city! Forgive me for this poor quality photo. I will make up for it by showing you video of this dog frolicking in a Santa outfit. You read that right! 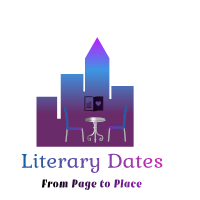 Follow me on Instagram @literary_dates and you’ll find it in my story highlights! You do not want to miss this! This tree was made out of paper cranes! Full tour post is up! Check it out here! Ooohh this book sounds like the perfect lighthearted and fun read! I need to add it to my list–after I read “Hidden Bodies,” the sequel to “You” 😉 And such gorgeous pics as always! How do you always take such stunning photos?! Can’t wait for the full tour!! Thank you!!! You’re seriously the best. I use my dinky little SE iPhone and then I edit them with Snapseed. 😊 I try to edit them to how I remember seeing them in person. I think I’m going to get a better phone soon so hopefully they will be even better! One day maybe I’ll get a real camera and take classes. I had to laugh: “A truck always gets in my shot.” GAHAHA. For me, it is always some random DUDE. I was trying to shoot my German Gluhwein with the Cologne Cathedral in the background. There is some guy’s face just staring at my wine and me like WTF?! The same for my Kolsch beer. Sigh. I am also laughing at the part of being back as a Christmas miracle. Girl, I feel you. Life is so busy. I’m glad you got to read a fast Christmas book and walk around the city. AND BLOG ABOUT IT! Yay, I’m following your blog now–I actually thought I was, but I blame Twitter and IG for giving me that fake sense of being a fan everywhere. Trucks have been getting in my shot since about day one! Haha! Oh man you should have yelled at that guy to get out of your shot! Not that I ever would. I’d just give him a look and hope he got the message. I did not accomplish my blogging goals for this weekend but hopefully I can still get out my full tour post before Christmas! I’m inching my way there! Thank you for visiting my blog and for your awesome comment!! Happy Holidays to you too!!! This tour makes me want to ditch California next year and visit NYC in December. Haha! It probably is a bit more festive here than in Cali. Thanks for reading my post! !